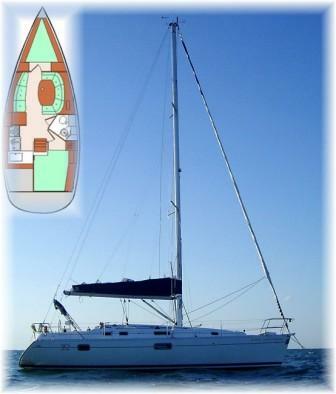 This 35 foot sloop has a well deserved reputation as a strong, comfortable, yet fast-performance cruising yacht. Don’t let her sleek lines deceive you, for inside she has the space of a traditional 40 footer! “Sunday Morning" is well equipped for cruising, whether for a day, a romantic evening under the stars, or for a week cruise to the Florida Keys or the Bahamas. Amenities include dockside Air Conditioning, Hot and Cold Pressure water, wide swim platform with shower, full size galley with plenty of refrigeration space, CD changer/stereo system with interior and cockpit speakers, plenty of hatches & ports for great ventilation in the cabins & main salon, and a large cockpit area for socializing. An inflatable dinghy and outboard motor are available for shoreside excursions. There are spacious accommodations for one couple or three singles, plus the captain. "Sunday Morning" is all set for a beautiful night at anchor under the stars! "Sunday Morning" Running With The Wind! The Interior space of a traditional 40 footer! Check out the latest racing results...although "Sunday Morning" is a comfortable cruising boat, she is fast!!! WINNER OF THE 2012 MIAMI TO KEY LARGO RACE ARC4 DOUBLE HANDED! 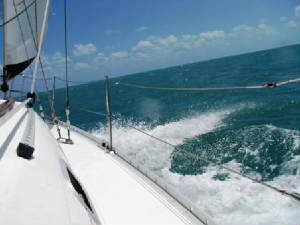 WINNER OF THE 2010 MIAMI TO KEY LARGO RACE ARC4 DOUBLE HANDED!